Ararat is a natural picture that can make anyone feel small and weak to what nature has created. Reaching a record altitude of 5137 meters Ararat is the highest mountain in the territory of Turkey. Called Buyuk Agri-Dag, the peak is located in the far northeast of the country where the border with Iran is only 16 km to the east, and with Armenia, 32 km from north. Covered with snow all year round the mountain can be seen from miles away. In essence, Ararat is quiet, and its snow cone is surrounded by glacial territory. This mountain is a powerful symbol in ancient history, resulting in that today it is the subject of much interest from archaeologists and religious activists. This mountain is also spoken in the biblical book of Genesis. It is believed that Noah and the Ark built by him appear to be accurate at this location after the flood. Several historical figures support this view. Among them are the chronicler Josephus, who in 70 years says that Noah's Ark really is of Ararat and Marco Polo also reached this conclusion. Unfortunately for their claims there is no scientific justification, although the wording found in Nineveh, dating from the 7th century and known as the epic of Gilgamesh, confirm this view. In the epic, Noah is described under the name of Utnapishtim, but he built the ark Life on the order of the god. Supposedly, however, they are adaptations of earlier Babylonian texts. The top Ararat is depicted in the center of the Armenian national emblem, but this area will never be Armenian domain. Before being given to Turkey in 1923, the mountain area around it were in the territories of the Soviet Union for several decades. 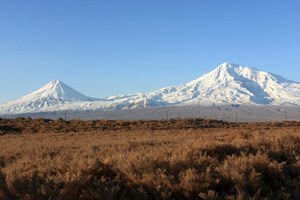 The mountain itself, Great Ararat , consists of a height of 5165 meters, and Little Ararat - 3914 m. Some tourists who wish to conquer the top will need to recruit a local guide and the climb and descent takes about 4 days. Since Ararat is in the protected area it is a popular tourist destination. To climb Mount Ararat , you must request to do so two months in advance in the local service distributed authorization.